Ed Gothic font is a fantastic font that was designed and published for the first time by Darrell Flood. This is clearly an outstanding font, it has fun characters, this font can be used everywhere you want this font to be used, as it can be used for printing reason, designing text brand and much more. You can download this font for free from right here for your personal use only. 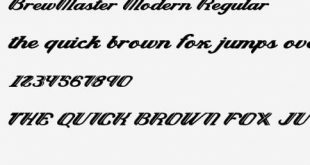 If you any kind of issue related to this font family or have any suggestion for us then feel free to comment right down here to share your precious views with us.